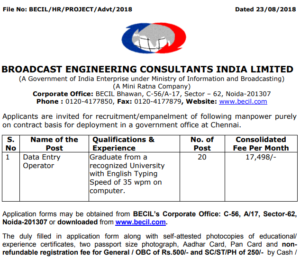 BECIL Data Entry Operator Recruitment 2018: 20 Vacancy Apply Online – Broadcast Engineering Consultants India Limited Assistant Manager, Shri Mahesh Chand has released an official job vacancy recruitment notification for 20 posts of Data Entry Operator. Board of Controller of Examinations is ready to provide consolidate fee per month of Rs. 17,498 for 20 posts. Besides, acknowledging the candidates that the last date for submission of application forms is September 14, 2018, they are also looking for a qualified and experienced people. Precisely, Board’s demand is that the person should be graduate from a recognized university with English typing speed of 35 WPM on the computer. In accordance with notification, Board is looking out for EPF/ ESIC Card (if any), Aadhar Card, PAN Card, Experience Candidates, Date of Birth Certificate, Educational and Professional Certificates as documents required at the time of verification. Apart from asking for Signature of Applicant and Date on Offline Application Form, you will also have to mention How did you learn about BECIL? From the website, advertisement, training institutes or others? 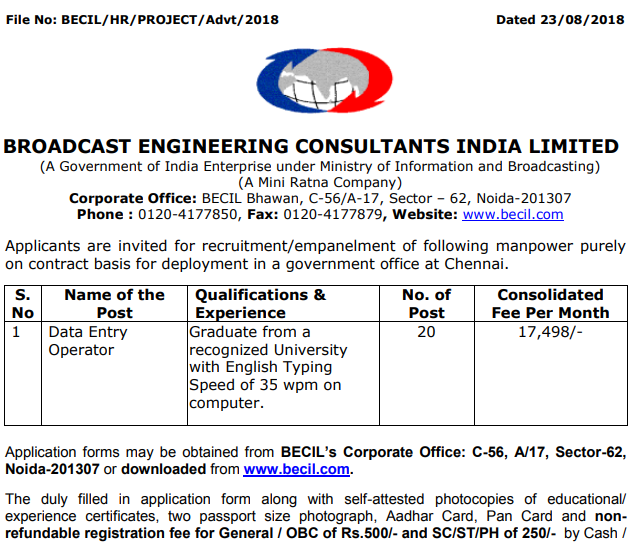 Otherwise be prepared to provide lots of complete details in BECIL Data Entry Operator Recruitment 2018 Application form like Languages known (what you can read, speak or write), if selected your preference for location, references (Names, Address and Contact Numbers), Total years of experience, work experience (from present position give details on every employment, add separate sheet if necessary). Keeping BECIL Data Entry Operator Recruitment 2018 Educational Eligibility Criteria in mind for educational/ professional qualifications like year of passing, division/ grade/ name of school/ college/ university, examination passed (graduation, XII/ HSC, X/ SSC), E-Mail Address, City, Address for Communication, Category – General, OBC, SC, ST or other, PAN Number, Employee State Insurance Number, details of the Universal Account Number (UAN) or Previous PF Member ID (if any), Date of Birth, Day, Month, Year, Father’s Husband’s Name, candidates name (separately first middle and last), and Application for Registration for the post of (means post name).